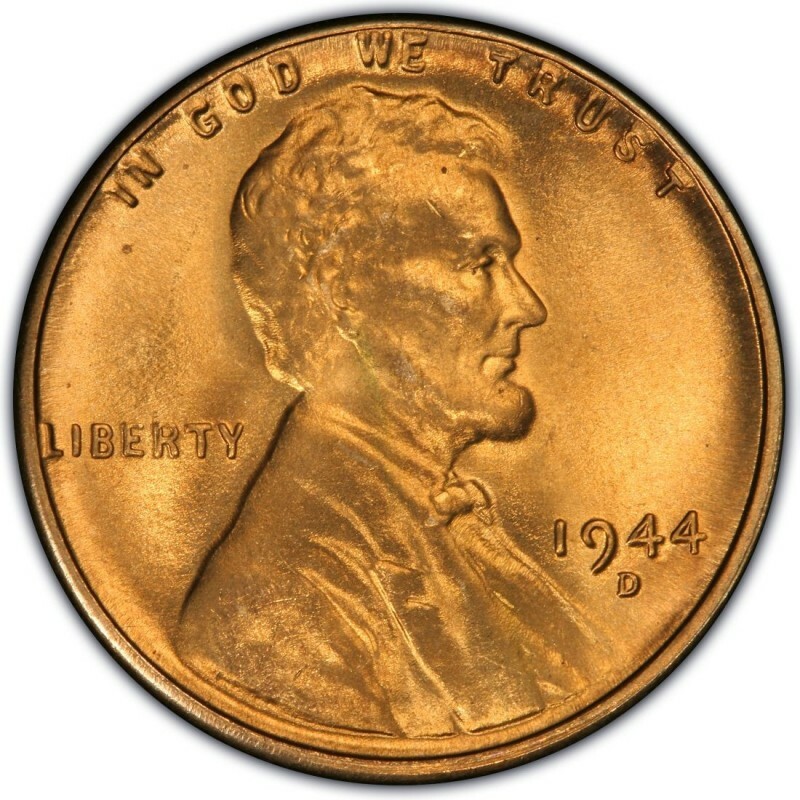 1944 marked the return of copper to the Lincoln Wheat Penny coins, though the denomination wasn’t struck with exactly the same composition as in 1942. 1944 Lincoln wheat cents were made with metal recycled from ammunition shells. 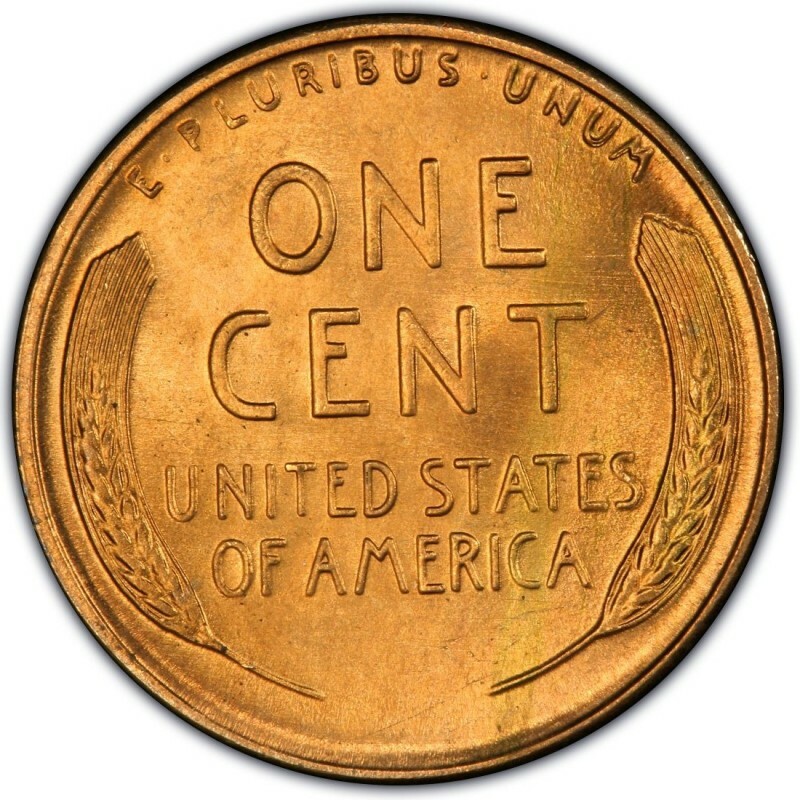 Unlike Lincoln cents made from 1909 to 1942, which are 95 percent copper and 5 percent tin and zinc, Lincoln cents from 1944, 1945, and 1946 were made with a composition of 95 percent copper and 5 percent zinc (no tin). However, the slight visual differences between 1944-1946 Lincoln cents and copper cents from other years in the Lincoln Wheat Penny series are only distinct among uncirculated coins. In other news for the 1944 Lincoln Penny, production figures were extraordinarily high, with about two billion one-cent coins made across all three mints operating in 1944; approximately 1,435,000,000 at the Philadelphia Mint; 430,578,000 at the Denver Mint (D); and 282,760,000 at the San Francisco Mint (S). Interestingly, there is a significant off-metal error from 1944, and that is the 1944 steel Penny – an inadvertent striking that presumably occurred when some 1943 steel Planchets were left behind in the hoppers that feed coin blanks through the striking machinery at the U.S. Mint. Approximately 30 or so 1944 steel cents are thought to exist, with each sporting a price tag ranging from $75,000 to more than $375,000, based on grade. 1944 Lincoln cents as a whole, though, are quite common and can be had for about 10 to 20 cents in most circulated grade. Uncirculated specimens can be bought for around $5 each. Keep in mind that many 1944 copper cents are still circulating and can be had at face value if luck strikes – searching rolls may improve your odds of finding 1944 Lincoln Wheat Penny coins without having to utilize the services of a coin dealer. I have a 1944 copper wheat penny thats overstruck on the back,is it worth anything? Hello, I have 1944 wheat penny that has an error at the back, missing letter ME for AMERICA, is this penny worth something? It would be helpful if you would please upload a photo of your 1944 Lincoln cent with missing ME so I can better assist you. HOW DO I LOAD PIC ON THIS SITE ?!?!?!? Hi Tommy. Please try adding pics using the "Attach file" button. I'm afraid the photo did not upload correctly. Would you please try again, using a jpeg photo file under 2 MB? Why does 1944 wheat penny not have an s ,d, or p under year. 1944 Wheat Pennies were minted in Philadelphia, San Francisco and Denver. If the penny does not have a mintmark then it was minted in Philly. I got three penny's that date 1935,1944 with a D under the year and a 1958 with a D under it also jus wondering if there were any value to them? I have a 1944/3 wheat penny if I find out my eyes are not playing tricks on me what do you think it will be worth? Would you please post a photo of this coin here in the forum so I can see what it is and provide some advice on its value? I have one as well, have you found any info on it? Michael, as Josh pointed out in the community, "The rare 1944 steel cent sticks to a magnet and looks silver in color. If your 1944 does NOT stick to a magnet and looks like a regular cent then your piece is relatively common and worth 5 to 10 cents." It is believed that only 30 of these 1944 steel pennies are in existence. I have a 1944 penny with a number 8 underneath it. is it worth anything? We would need to please see a photo of this coin to verify, so please post a topic in the forum. But it sounds like you have an altered, counterstamped 1944 Lincoln cent. Unless the origin of the stamp can be traced, such altered 1944 Lincoln cents are generally worth only 2 to 3 cents. Again, some counterstamped coins are actually worth more because they are collectible as what some might call "exonumia" coins (altered, coin or coin-like items), but generally only if we can determine the origin of the stamp, which came from a private individual or company outside of the Mint. Hi , I have a ONE CENT 1944 Lincoln penny , How much i can sell? For a common, circulated 1944 copper wheat penny you probably couldn't get much more than 10¢. I have 1944 steel one please check photos, at first, I thought it was from another coin, but at closer inspection, I noticed that the error is actually part of this coin. I've never seen anything like this. Its pretty neat. I'm not sure if you would call it a lamination error, or a cracked skull. , would my coin worth something? I have a 1944 penny and would like to know how much it's worth !!! As mentioned in the article above, an average circulated 1944 Lincoln wheat cent is generally worth 10 to 20 cents. Would you please post a photo of your 1944-S penny here? What does this coin weigh (in grams, down to the hundredth of a gram)? This coin sounds like something worth checking out, but it will need to be evaluated further before we can determine exactly what's going on with it. I have two 1943 steel penny's one with mint mark S and one with no mint mark. both stick to magnetic, trying to see if they are worth anything. If both of your Lincoln steel cents are magnetic, then that is normal and they are worth 10 to 25 cents each in circulated condition. I have a 1944 steel Lincoln wheat penny would like to see what it would be worth. I have one 1944 penny. Where can upload the pictures? Please peruse our Lincoln Wheat Penny info pages for more information on each of your coins. I have a 1944 wheat penny. How can I tell if it is worth any money.